Have you ever wondered why is aluminum so easy to recycle? Well, the answer lies in its weight and strength. As an element, aluminum comes with very unique properties. For example, its density is low and accounts for it being amazingly lightweight as a metal. In the same time, this lightness does not affect its strength and does not make it brittle at low temperatures - but increases. However, when it comes to high temperatures, aluminum is known to decrease its strength, making the metal easy to manipulate with and repurpose it. 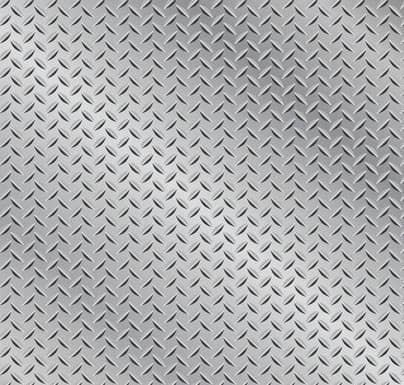 Basically, aluminum's properties excel when it comes to formability, conductivity, joining and reflectivity - for which it is known to be one of the best metals to work with and repurpose. Hence, recycling it is not a tough pill to swallow, but the best thing one can do with aluminum after using it as a product or component. Another interesting thing is that aluminum as a metal is non-magnetic and non-toxic. For its non-magnetic properties, it is commonly known as the single metal that is used in magnet X-ray devices, while the zero toxicity best comes to light when it comes to aluminum's presence in drinking water to begin with, as well as a lot of foods and pharmaceutical products. 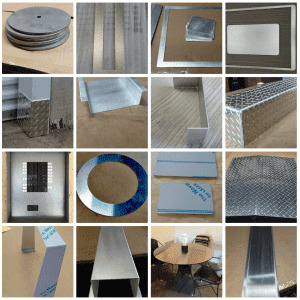 While we offer aluminum sheet metal in the quality 5052-H32, just to get one time more technical, there are many other different qualities of aluminum available. The aluminum sheet metal we use is the most common, and is also the easiest to work with considering the different stages the metal goes through when you order a metal part from us. It is hard enough to bend, it is better than others to weld. We offer 3 different thicknesses and another 3 thickness covering the diamond (tread) plate surface. The thicknesses we offer for the mill finish surface are: 1/32" , 1/16" and 1/8"
The thicknesses we offer for the diamond plate sheet metal are: 1/8", 3/16" and 1/4"
As always you can choose from 14 different shapes and can enter your own measurements to get your individual aluminum sheet metal based metal part.